One thing all of us have in common is that we have all accidentally burnt ourselves in one way another. A mild burn from hot cup of coffee or a severe burn from kitchen grease while cooking. One thing we can all agree on is that burns hurt. And even worse, the pain endures until the skin starts to heal. Before you treat your burn, it is important to determine what kind of burn you have, as some burns are worse than others and demand medical attention. First-degree burns are the least severe of the three types of burns. This burn affects the top layer of your skin and possibly the underlying layers. First-degree burns are characterized by pain and redness. Sunburns often fall into this category. First-degree burns can typically be treated at home by placing the injured skin under a faucet of cool water or applying a cool water and essential oil compress to the burned area. Second-degree burns affects the top and possibly the underlying layers of the skin. With second-degree burns, you may experience a great deal of pain as well as some blistering of the skin. These types of burns can sometimes be treated at home, however, if this burn covers your face or hands, its wise to seek medical attention. If the second-degree burn is not too serious, it can be treated just like a first degree burn with cool water and essential oils. However, if you are an extreme amount of pain or the blistering is severe, you may want to seek medical attention. Use your best judgment. Third degree burns are severe and can not only affect the layers of skin, but the muscle and tissue as well. The skin affected from this type of burn may be red, yellow, white, and black with a leathery appearance. These burns may range from extremely painful or not very painful due to nerve ending damage. Third degree burns can be the result of fire, chemicals, or electrical accidents. In the case of third degree burns, seek medical attention immediately. Do not remove clothing stuck to the burn, and do not try to treat the burn yourself with essential oils, water, and ice, which will often make the burn worse. If a wet chemical has burned you, flush it off the skin immediately and call 911 immediately. If it is a dry chemical, try to brush it off your skin quickly without causing anymore damage to the skin. It is important to remove the chemical off your skin as soon as possible, as it will continue to burn you with prolonged contact. If your burn is not severe, you can often treat them at home. There are several essential oils that not only provide soothing pain relief, but also help expedite the healing process while preventing further damage to the skin as well. Lavender essential oil is quite possibly the most popular essential oil in terms of treating burns. A famous story tells how chemist René-Maurice Gattefossé badly burned his hand in an experiment and used Lavender essential oil to heal it with minimal scarring. This accident, which occurred in 1910 is often cited as the modern rediscovery of essential oils. Used for centuries, this sweet floral oil cuts the pain while promoting healing. Lavender essential oil promotes the regeneration of new cells and tissues, decreasing the likelihood of scarring. While your burn is healing, it is important to watch out for subsequent infections. Fortunately, lavender essential oil has antibiotic properties, helping to nip any further complications in the bud. I have recent first hand experience of the effectiveness of lavender essential oil when it comes to treating burns in children. Just last week, my 5 year old daughter wanting to impress me tried to help my wife make scrambled eggs for breakfast. Unfortunately after doing a great job of breaking and mixing the eggs, she touched the hot pan and a great deal of wailing ensued. I can sense the feelings of disapproval but part from learning that you should not let your children near a kitchen, I learned that lavender oil was an excellent remedy for a minor burn. We immediately ran her finger under a faucet before applying lavender oil diluted in coconut oil to her burn and covering it with a plaster. She almost immediately stopped crying and by the next morning, there was very little sign that she had been hurt at all. The cooling menthol effects of peppermint essential oil are soothing to burned skin. Peppermint essential oil is great for kitchen burns and scalds from the oven, stove, and steam. After you have cooled the affected area by running cold water over it, apply peppermint oil to further reduce the heat. Peppermint essential oil has great cooling properties thanks to its very high menthol content. It can prove invaluable in your medical cabinet especially as an instant remedy for kitchen burns. There are several ways to use peppermint oil on your burns and scalds. Peppermint essential oil combines well with Aloe Vera to treat burns. Simply combine 3 drops of your peppermint oil with a tablespoon of Aloe gel and apply the mixture directly to your burn as soon as possible after the injury. 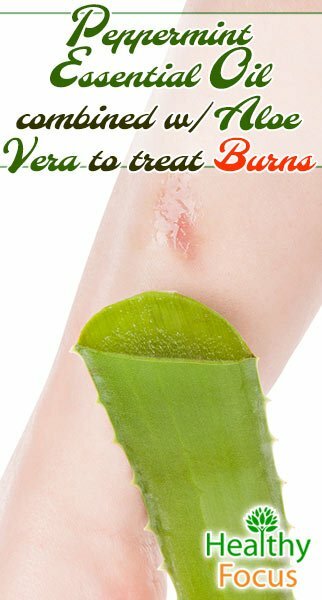 Aloe Vera is an extremely useful thing to have on hand especially for skin problems but if you don’t have any Aloe at home, you can use another oil as a carrier and coconut oil works extremely well. Make a burn spray by adding around 25 to 30 drops of peppermint essential oil to 100 ml of water in a spray bottle. Shake it up well and liberally spray the affected area of your skin. Roman chamomile has a remarkable ability to help heal burns. This anti-inflammatory essential oil makes a wonderful treatment, soothing painful burns. The antiseptic nature of Roman chamomile essential oil also prevents infection from occurring. Helichrysum essential oil is wonderful for burns and surrounding tissue. This healing essential oil contains anti-inflammatory properties and encourages the regeneration of new cells, perfect for preventing scarring. Helichrysum essential oil may help with older scars; however, it is most effective with fresh scars. Helichrysum essential oil also majorly cuts down the pain factor as well. If you have an unsightly scar from the result of a burn, there are essential oils you can use to help make the scar vanish. Neroli essential oil is great for healing both fresh and old scars. When trying to heal a scar, mix ten drops of neroli essential oil with once ounce of rosehip seed oil. Apply this mixture to your scar twice a day, daily. It is important to be diligent with this treatment, as old scars may take as long as three to six months to fade. When treating burns, calendula is truly a great ally. This powerful essential oil is anti-inflammatory, cutting down the redness and puffiness of a painful burn. Calendula essential oil encourages the growth of new cells and tissue, expediting the healing process. Applying calendula essential oil to your burn during the healing process will also help prevent scarring. Calendula is also available in the form of an “herbal oil” or as an extract. Tea tree essential oil is a great way to treat burns if you are experiencing a great deal of pain. Tea tree essential oil is a valuable part of your first aid kit, because it works as a treatment for a wide array of topical skin issues. This powerful essential oil not only helps promote the healing process and help eliminate pain, it also contains antifungal, antibacterial, and antiseptic properties, making it a great way to avoid infection while your burn is healing. Manuka essential oil is another way to treat burns. Manuka essential oil has antiseptic and skin healing qualities. 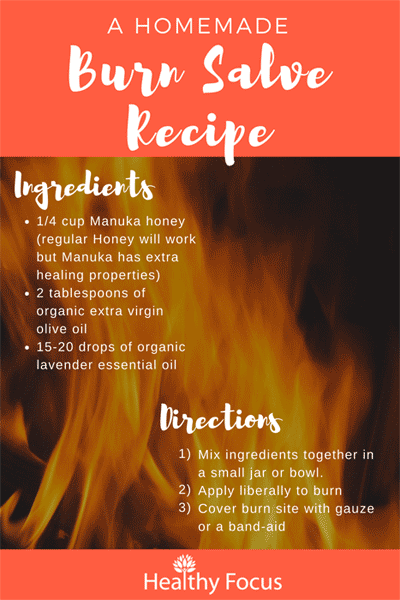 Alternatively, Manauka Honey also has burn and wound healing capabilities-read more about it here. For a simple kitchen burn resulting from steam or heat, run your burnt skin under a faucet of cool water for a couple of minutes. Then apply a couple drops of essential oil mixed with a carrier oil (such as sweet almond or sunflower oil) directly to the area. For a soothing gel, mix ten drops of essential oil with a half cup of aloe vera gel. Apply this healing mixture hourly until your burn starts to heal. To make a soothing cool compress, soak a clean cloth in cool water and then wring out the excess moisture. Add a couple drops of essential oil to the compress and apply directly to the affected area. Make sure not to use water that is too cold, which can further damage fragile skin. For burns that cover large areas, such as sunburns, you can make a healing mist. 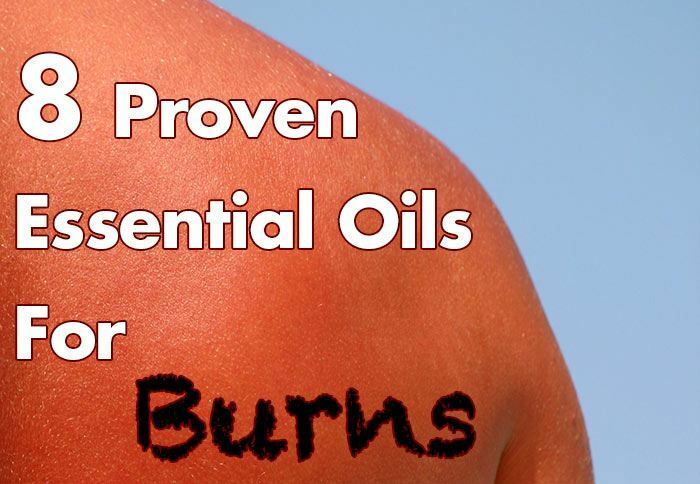 If you have sunburn, you may want to consider taking a soothing bath in essential oils. Fill your tub with tepid cool water. Add eight drops of lavender essential oil, two drops of Roman chamomile essential oil, and one drop of peppermint essential oil. Relax and soak in the tub for 20 minutes. Mix ingredients together in a small jar or bowl. All of the ingredients in the salve have some burn healing properties—even the olive oil. If you have UMF 10+ or equivalent Manuka Honey, it has even more healing properties than regular honey. You could substitute coconut oil for olive oil—but the texture and ease of mixing might be harder. Gently warm the coconut oil until it liquefies to ease mixing if you go that route. We emphasize organic ingredients where possible—especially for wound healing and burns—as extra chemicals could potentially irritate damaged skin. It is easy to get excited during the hot and sunny time of year, many people will be headed to the beach or sat in their garden hoping to get that perfect body tan. Unfortunately, it is easy to overdo it and sunburn can often be the painful result. You can however produce a perfect sunburn remedy with lavender and peppermint essential oils combined with virgin coconut oil and Aloe Vera. This soothing combination will soothe inflammation and redness while fully re-hydrating your skin. Put 2 or 3 inches of water in a saucepan and place it on a medium heat. Put your virgin coconut oil and the Aloe Vera liquid into a jar then put the jar into the saucepan. Stir the mixture until the mixture has liquefied fully. Once the mixture has combined in the jar, take it out of the pan and add your lavender and peppermint oil then mix it up well. Pour the whole lot into a spray bottle and store it in a cool dry place ready for use when necessary. As mentioned above, if your burn is not a simple first-degree burn, seek medical intervention immediately before trying any home remedies. Use your best judgment. Essential oils are not recommended for the use of children, pregnant or nursing women. Before applying essential oil to fragile skin, be sure to do an allergy patch test on healthy skin to avoid further damage or an allergic reaction. Always dilute essential oils before applying to your burns. When choosing a carrier oil, avoid most vegetable-based oils or anything containing fat, which can increase the severity of a burn. Note: Olive oil has been shown both topically and orally to help speed healing but some oils can make burns worse.